Step 1: Download the Selection list and Check your result. Step 2: Download the Formats. Step 3: Submit the Required formats along with admission application form. Step 4: Verification of documents: Certificates from the competent authority in respect of Rural, OBC, SC, ST and Disability are to be submitted to the JNV for verification of documents / eligibility to confirm admission to Class VI. It is informed that admission will be given only to the selected candidates after due verification of the documents. Parents are advised not to take TC from previous school until the admission is confirmed. Admission to JNVs is done free of cost. No fee is to be paid to school authority for admission to Class VI. The parents/students are required to approach directly to the Principal of the concerned JNV. After verification, JNVs will confirm the admission, if the candidate found eligible as per NVS norms. 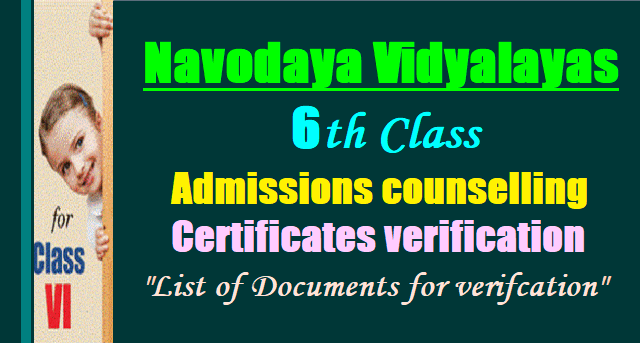 The Navodaya Vidyalayas 6th Class admission Application form to be filled in by the Parent/Guardian of the Candidate with the help of the Headmaster/mistress of the School from where the candidate passed Class V Examination. (C) Name of the Village or Town in which school is located. Certified that the information given above is true to the best of my knowledge and belief. In case, any part of the information furnished by me is found incorrect, the admission of my child/ward may be cancelled. I am ready to produce the relevant certificates issued by Competent Authorities as and when asked for. Entries verified, certified and found correct. Certified that the information given above is found correct as per our school records. It is also certified that Master/Kumari was ..............admitted in this School in Class...........on (date) and passed Class.....on............(date). I, Father/Mother/Guardian of Kumari/Master...... ..who got selected for admission in Class VI in JNV, District_ hereby give an undertaking that I understand that, for promotion of National Integration and as per the scheme at JNVs, 30% of the students of class IX from one JNV have to migrate to another JNV from non-Hindi speaking area to Hindi speaking area and vice-versa and I agree to abide by the rules of NVS in this regard. 17. Remarks of Medical Officer : Recommended/not recommended for admission/Recommended to C.M.O for Verification if any. If the candidate is selected under disabled quota he/she should bring the certificate issued by the competent authority. Community certificate in the prescribed format from the competent authority is to be submitted by the candidate, wherever necessary. As per Jawahar Navodaya Vidyalaya, District... State...letter No:...dated:... my ward Master/Kumari .....has qualified the entrance exam for admission to Class VI at JNV, District... ,State....during the session 2019-18. *The area of residence falls under the Rural /Urban area of the district Certified that the information furnished by me is true and no fact has been concealed. *Applicable for the students who seek admission through the studies in NIOS. This is to certify that the above information furnished by Shri/Smt.....Father/Mother of ....Master/Kumari ....... a candidate for admission to class VI in JNV,District.... has been verified from the records and is found to be correct. I, (Father/ Mother/ Guardian) of Kumari/Master who got selected for admission into Class VI in Jawahar Navodaya Vidyalaya, …………….District hereby give an undertaking that I am ready to pay Rs.200.00 (Rupees Two hundred only) per month or revised amount or as charged by the Navodaya Vidyalaya Samiti, Noida from Class IX to XII. Note: This is not applicable to SC/ST categories and all girl students and the parents whose Income is below poverty line.